An interactive mobile texting aftercare program has shown promise as a means to help teens and young adults engage with post-treatment recovery activities and avoid relapse, researchers report. In a NIDA-supported pilot study, the program, called ESQYIR (Educating & Supporting Inquisitive Youth in Recovery), reduced young people’s odds of relapsing by half compared with standard aftercare. Dr. Rachel Gonzales and colleagues at the University of California, Los Angeles (UCLA), designed ESQYIR to teach and reinforce wellness self-management in a manner that fits young people’s attitudes and communication styles. The researchers cite numerous advantages of the mobile texting approach: It is inexpensive and features personalization of content, convenience of use, ease of assessment and monitoring, and flexibility in the time and location of delivery. Many young people comply poorly with aftercare interventions and resist involvement in 12-step programs and other post-treatment recovery activities. Dr. Gonzales says, “Teens and young adults don’t want to be stigmatized as having a disease or as still being in recovery. In their minds, after the primary treatment, they are done.” Young people often don’t view addiction as a disease, she adds. Instead, they regard substance use as a matter of lifestyle and personal choice. As a result, as many as 85 percent of teens and young adults relapse within 1 year. Dr. Gonzales and her research team reckoned that young people might engage more readily with aftercare built on text messaging. This mode of communication is ubiquitous among young people, surpassing most other forms of social interaction. Messages can be personalized and can be accessed and responded to privately, when and where youths find it convenient or feel a need for help. Text messaging interventions are already used to treat maladies including obesity, sexually transmitted diseases, and tobacco dependence in young adults. “The most effective programs take into consideration the users, their needs, their desires, and their way of connecting,” Dr. Gonzales says. Accordingly, when she and her team composed the text messages for Project ESQYIR, they solicited input from young people in recovery from substance use disorders (SUDs). “The program’s text messages are based on their voices, parallel their views of recovery, and speak to their recovery needs,” Dr. Gonzales says. The participants in the ESQYIR pilot study were 80 volunteers, ages 14 to 26, who had been treated in outpatient and residential community treatment centers in the Los Angeles area. The drugs that had caused them problems included marijuana (55 percent), methamphetamine (30 percent), cocaine (15 percent), heroin (11 percent), prescription drug (6 percent), and other substances including alcohol (4 percent). Half of the participants received the mobile texting ESQYIR program, the other half received the standard aftercare offered by their treatment facilities, which consisted of referral to 12-step programs. Figure 1. 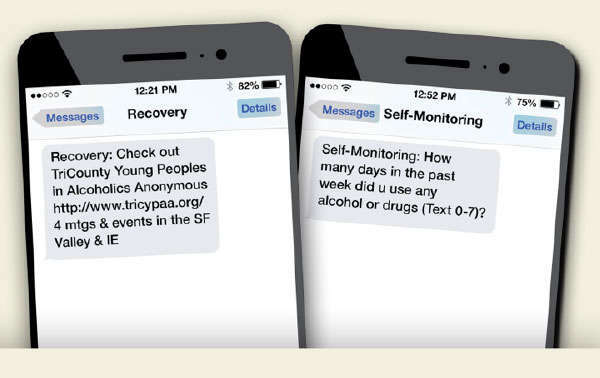 Daily Mobile Texts Prompt Self-Monitoring, Give Recovery Advice and Encouragement The participants in the text messaging program received daily text messages with tips to self-monitor their recovery- and substance use–related behaviors and with alerts to aftercare services in their community. Weekdays at 4 p.m., the participants in the ESQYIR group received a text that prompted them to self-monitor and text back numerical ratings of their abstinence confidence, wellbeing, substance use, and recovery behaviors (see Figure 1). The participants then received a feedback text, automatically selected from more than 600 possible messages, which provided motivational/inspirational encouragement, coping advice, or positive appraisal tailored to the participants’ self-rating. For example, motivational feedback texts encouraged participants to keep on track with recovery and attend therapy or self-help meetings when needed. Dr. Gonzales says, “The self-monitoring texts helped participants remain mindful and aware of potential relapse triggers, particularly in risky situations.” With that awareness and the feedback provided by the program, the young people were able to generate strategies for coping with such situations without drugs, the researchers suggest. On weekends, the participants received personalized texts with educational information adapted from NIDA reference materials and resource information on local support services. Figure 2. Text-Based Delivery of Aftercare Content Decreases Relapse Teens and young adults receiving daily text messages had lower relapse rates than peers receiving only standard aftercare. The UCLA researchers monitored the participants’ urine for alcohol and drugs monthly during the program. The results indicated that with passing time, the text-based aftercare participants’ odds of relapsing to their primary substances rose only half as fast as those of the standard aftercare group. Compared with the participants in standard aftercare, those assigned to the ESQYIR group were less likely to have relapsed 1 month (8.6 percent vs. 30.3 percent), 2 months (3.6 percent vs. 39.3 percent), and 3 months (14.7 percent vs. 62.9 percent) after the end of their substance abuse treatment (see Figure 2). The researchers followed up with 55 of the original 81 study participants 180 days after the end of treatment (90 days after the end of the aftercare programs). Those who had received the ESQYIR mobile wellness aftercare intervention were still less likely to have relapsed (21.4 percent vs. 59.3 percent). The ESQYIR and standard aftercare participants both attended on average ten 12-step meetings per month during their last month in substance abuse treatment. Both groups reduced their 12-step attendance in the aftercare period, but the ESQYIR participants did so to a lesser degree (8.9 vs. 2.9 meetings in the final month). The two groups no longer differed significantly in 12-step attendance during the third month post-aftercare (7.0 vs. 4.6 days per month). However, during that month the ESQYIR participants were more involved in other recovery-related extracurricular activities (e.g., exercise, walking, and community/volunteer service) than those who received the standard aftercare. Dr. Gonzales and colleagues are planning a larger, stage II efficacy trial of the mobile-based ESQYIR aftercare wellness intervention. For this trial, they are enhancing the program with new features, including text messages to foster HIV awareness and prevention. Dr. Campbell Chambers concurs with Dr. Gonzales that although the pilot nature of the study and its relatively small cohort size make its results only preliminary, the findings are very promising. The UCLA study team will soon publish a report on the ESQYIR program’s effects at 6- and 9-months post-participation. This study was supported by NIH grant DA027754. Take a free self-paced online course, presented jointly by NIDA and IRETA, about the use of technology throughout the continuum of care for patients with addiction: Electronic Tools for Use in the Continuum of Care for Patients With Addiction. NIDA. "Text Messaging Aftercare Intervention Cuts Youths’ Risk for Relapse." National Institute on Drug Abuse, 30 Jun. 2015, https://www.drugabuse.gov/news-events/nida-notes/2015/06/text-messaging-aftercare-intervention-cuts-youths-risk-relapse. NIDA. Text Messaging Aftercare Intervention Cuts Youths’ Risk for Relapse. National Institute on Drug Abuse website. https://www.drugabuse.gov/news-events/nida-notes/2015/06/text-messaging-aftercare-intervention-cuts-youths-risk-relapse. June 30, 2015.